The terms flat feet and fallen arches are used interchangeably to refer to a condition in which there is no arch of the foot. The arch is formed by tendons in the foot that stretch from the heel to the base of the toes, or metatarsals. There are also supporting tendons that originate in the lower leg. Together, these tendons work to form an arch, noticeable as a slight rise in the inner midsole of the foot. This rise, or arch, can be classified as a normal arch, a high arch, or a fallen arch. When tendons do not work together to pull properly, a fallen arch or flat foot occurs. 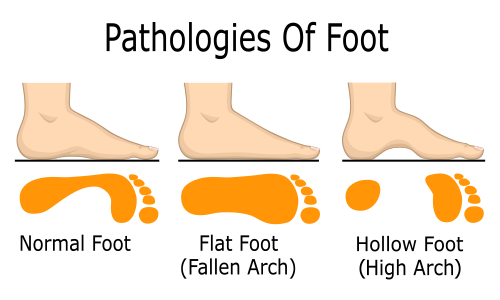 Aside from the occasional pain associated with flat feet, problems with fallen arches can extend upwards to the ankles, knees, hips, and even the back, leading to an altering of the biomechanics of the body. Most cases of flat feet or fallen arches are not painful and need no form of treatment. However, common symptoms include pain in your feet (particularly in the area of your heel or arch), pain in your feet that persists after long bouts of physical activity or standing up, achy feet, or arch pain when standing on the tips of your toes. Most cases are not preventable. Treatments for flat feet include rest, ice, compression, medication to relieve pain, orthotics, or in some cases surgery. Our physicians at American Foot & Leg Specialists evaluate every case on an individual basis and work hard to create a tailored plan to address any issue you have with flat feet or fallen arches. Don’t put off going to the foot doctor. Call us at American Foot & Leg Specialists. We are conveniently located to serve cities in the south metro Atlanta area along with Riverdale, Newnan, Griffin, McDonough, and Morrow. Make an appointment to give your feet some tender loving care.